Are you a keen skater? Join the Sunday Stroll skaters this weekend..
London Friday Night Skate (LFNS) and Sunday Stroll are weekly marshalled street skates in central London. The LFNS departs from Wellington Arch at Hyde Park Corner every Friday at 8pm. 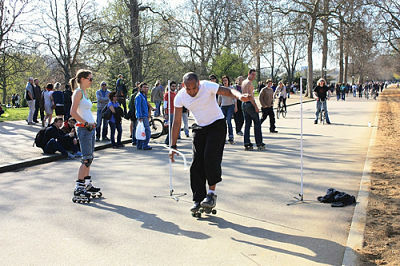 The Sunday Stroll departs from Serpentine Road in Hyde Park every Sunday at 2pm. We use different routes each time – one day we might take in famous central London roads and sights, another time we’ll head for some long fast down hills in Camden or Putney, or even a trip to the countryside out at Barnes. 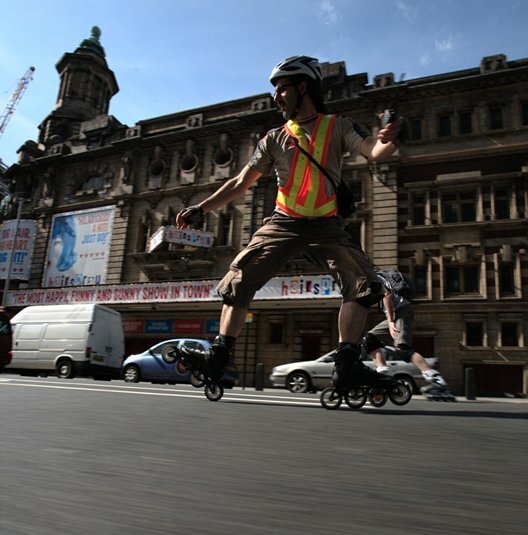 The events are open to all skaters able to stop, turn and control their speed on hills. The Sunday Stroll is a relaxed slow paced skate; the LFNS is faster, more technically demanding and may involve hills and sprints. We welcome both inline (‘rollerblade’) and quad (‘roller skate’) skaters. Children are welcome provided they’re accompanied by a responsible adult willing to take them home if necessary. Route information is usually published mid-week and can be accessed via the links above. You can also find LFNS on Facebook, on Twitter, or subscribe to their weekly email newsletter. LFNS runs purely for the joy of skating. 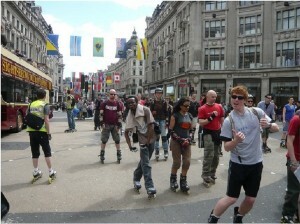 Participation is entirely free and the skates are staffed entirely by volunteers. Listen to the announcement at the start to find out who the lead marshal is. He or she is usually wearing a red vest with flashing lights. A clear head: Alcohol is a no-no: it affects your judgement and dehydrates you more quickly.It also creates a bad impression of the skate in the eyes of bystanders, other road users, and the police. If we see you skating with an open alcohol container, or if you’re apparently drunk, we will ask you to leave the skate.